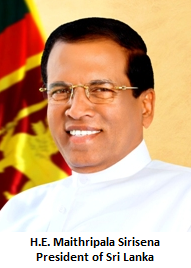 US President Barack Obama yesterday congratulated Sri Lanka's newly-elected President Maithripala Sirisena on his victory. "On behalf of the American people, I congratulate the people of Sri Lanka on the successful and peaceful conclusion of Sri Lanka's presidential election and incoming President Maithripala Sirisena on his victory," President Obama said in a statement. The US President also commend the outgoing administration of former President Mahinda Rajapaksa for facilitating a swift and orderly transition of power and said "Beyond the significance of this election to Sri Lanka, it is also a symbol of hope for those who support democracy all around the world." International and domestic monitors and observers were permitted to do their jobs, he said. President Obama noted that Sri Lankans from all segments of society cast their ballots peacefully, and the voice of the people was respected. "At this moment of hope, the United States looks forward to deepening its partnership with the people and government of Sri Lanka and to working with President Sirisena to advance peace, democracy, and prosperity for all Sri Lankans," the U.S. President said.